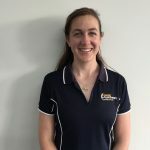 Jayne grew up locally on the North-West Coast of Tasmania before heading off to the mainland to study a Bachelor of Physiotherapy at Charles Sturt University in Albury NSW, graduating at the end of 2010. She worked at Whyalla Hospital in regional SA for over 12 months, mostly in Paediatrics and in-patients before returning to Tasmania in 2012 where she worked in the aged care sector for 2 years. Professionally Jayne has a strong interest in paediatric development and falls prevention in older populations together with general musculoskeletal injuries. Outside of work she spends a lot of time cycling and racing both road and mountain bikes.